Written by WeeblrPress on 25 April 2017 . Accelerated Mobile Pages is in the news, and in case you missed it, WP Engine dedicated one of their webinar to AMP, under the title: AMP for WordPress: the inside scoop. This was a joint presentation by David Vogelpohl from WP Engine and Joost de Valk, the well-known founder of Yoast.com. 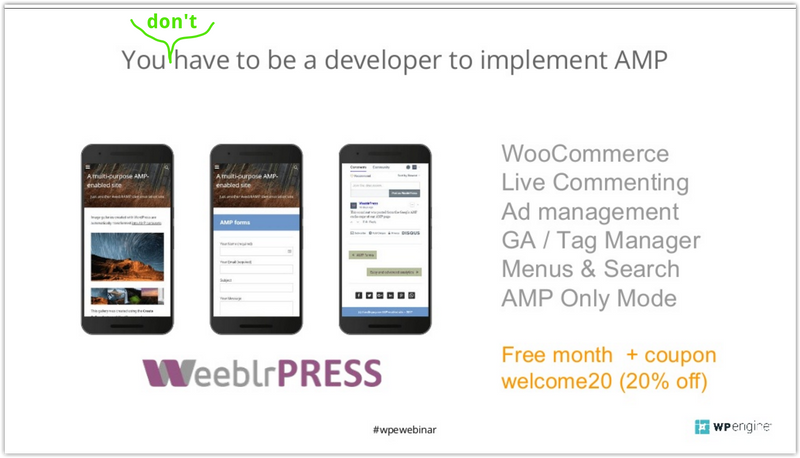 After just been in touch with them for a few days, they selected weeblrAMP to be one of two methods presented to add AMP to your WordPress site. The other one being the standard AMP plugin by Automattic, completed with Yoast AMP glue plugin. The webinar was recorded, and the slides are available on this page of WP Engine.com. Looking forward to seeing them both at WordCamp Europe 2017!